The newest modern Mediterranean designed residence by GLH with spectacular city views in Southern Highlands.At 10,400 sqft this private estate has a 9 car garage w/fully integrated Tesla Power System and Tesla Car. Plan offers up to 6 bedrooms,office,ultra lounge,theater,sleek bar w/transparent wine room,private hideaway master retreat with spa inspired bath,Couture style closets,culinary master style kitchen, automation,resort pool/spa. 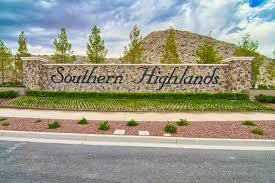 New modern-mediterranean estate located within the guard-gates of Southern Highlands Golf Club. Designed by Growth Luxury Homes, this luxury home spans 7,400 square feet and boasts endless features including an in-home movie theater, 2 game rooms, wine cellar, office, master retreat, couture-style closets, life-view deck and a 6-car garage with fully integrated Tesla Power System.